Today is the 12th of April 2017 (at least it is already in Perth) and is now known in the Microsoft Dynamics GP community as “Fabrikam Day” thanks to the Training Dynamo herself, Amber Bell. While most customers set up a test company based on their live company’s data, partners including ISVs (Independent Software Vendors) and sales & support consultants have usually used the Sample or Lesson company that comes with Dynamics GP to demo and test. When you log into the Sample or Lesson company by default the system will change the User Date so that it is aligned with the sample data. You will also be shown a dialog to notify you that this change of date has occurred. 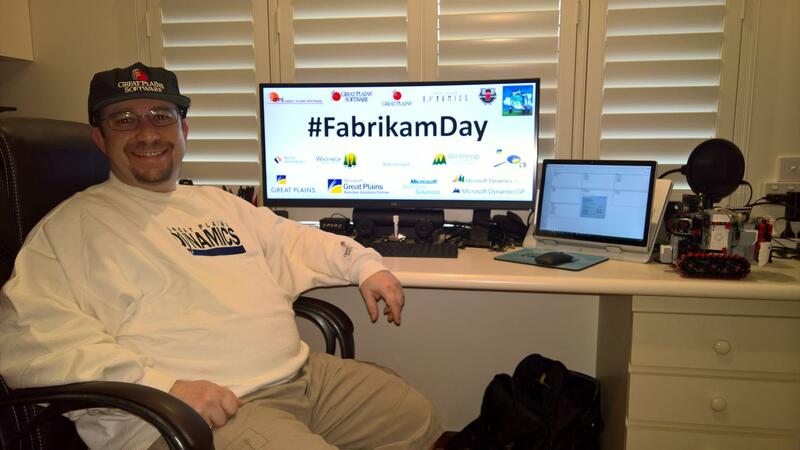 As the sample company has been known as Fabrikam, Inc. or Fabrikam, Ltd. since Microsoft acquired Great Plains, that makes today Fabrikam Day, the day when the sample company date is actually correct. I must admit that I have not seen that dialog is a number of years, not because I don’t use the sample company, but because I found a way to prevent the dialog showing and so I could save an extra mouse click. I definitely do use the sample company and over the years have become best friends with customer/debtor AARONFIT0001 (Aaron Fitz Electrical), vendor/creditor ACETRAVE0001 (Ace Travel Company) and items 100XLG (Green Phone) & 128 SDRAM (128 meg SDRAM). Note: Ace Travel Company was changed to A Travel Company after a real Ace Travel Company complained to Microsoft. So why do I question that today is Fabrikam Day? Well, it goes back to a history lesson. Firstly, the sample company used to be called The World Online, Inc. or The World Online, Ltd. This is why the sample company database is usually called TWO and not something like FAB. According to the comments in the source code, Brian Roney made the change on 27-Jan-2004 to make the date change when logging into the lesson or sample company. The date that was used was 12th of April 2007. 27Jan04 BRONEY PR41770 : Lesson Company date change. When version 10.0 was released, 2007 had arrived and a decision to move the sample data forward ten years was made. To match the data on 02-Mar-2007 Rob Wagner adjusted the code to the date we have today 12th of April 2017. 02Mar07 RJWAGNER Move sample date data ahead by 10 years. It seems that changing the date caused some problems with the testing macros and so a method to override the date and return it to 2007 (or any other date) was added by Rob Wagner on 26-Jun-2007. The following Dex.ini setting can be used to set the sample company date to any valid value, if the date is not valid it will fall back to the default. So… is today Fabrikam Day or did that happen ten years ago? Should it be The World Online Day? Should we all set the date forward another ten years and run a script to add ten years to the demo data? Here is a screenshot of the PowerPoint slide I created for the occasion with all the logos (click on it to expand). Trivia, old stories, of course, but new stories too. It’s time to relax and just be with friends. Be prepared to do a Skype video with your team. Group together as much as possible. GP unites. I understand for some of you it’s not a convenient time, so feel free to organize your own event at 4:12 on 4/12/2017. Also I will be doing trivia throughout the day with the #FabrikamDay tag. So, so watch twitter too. Watch for updates on Twitter using the #FabrikamDay hash tag. 13-Apr-2017: Added link to article with scripts to update sample company data. Happy Fabrikam Day – and thank you Microsoft! I got a call from one of my consultants this morning about our demo environment being down and they could not do training. I quickly checked the server, checked resources, permissions, did a db restore, ran Dex Uitilities… OMG nothing was working. I check other installations and sure enough same problem. Every test environment in the company was experiencing the same problem. It turns out that Fabrikam will not work on Fabrikam Day – it is a holiday or a Time Bomb. Not sure what will happen after Fabrikam day but this will gets my training classes going.